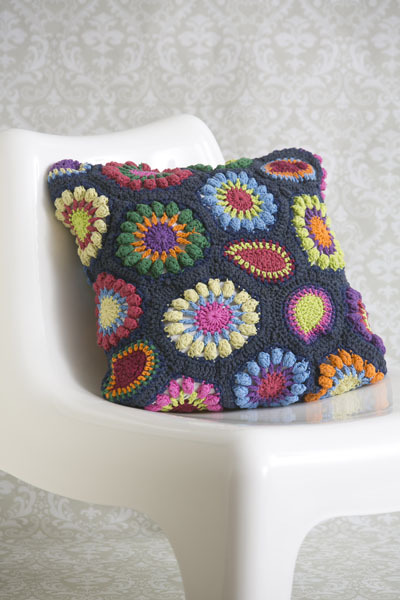 Spice up that drab sofa in no time with the brightly-colored Retro Flower Cushion. It uses only two motifs, each made in two sizes. 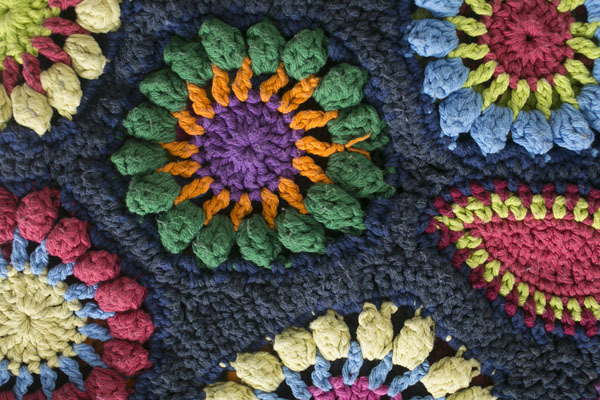 The main leaf motif uses the five basic crochet stitches, so it’s ideal for a group or teaching project or for a crochet novice. Popcorn: Worked into a chain space as follows: Make 3 ch, then 3 dc. Pull up working loop and remove hook. Insert hook from front of work to the top of the first 3ch. Pick up working loop from behind the 3 dc, yo and pull it through everything on the hook. Popcorn made. Popcorn Flower Motif: Starting from the center, this flower is worked in the round, using a different color for each part of the flower. Then, using background color, a round of single crochet worked around the edge, followed by a round of double crochet. Leave long ends for darning in later. Using center color, ch 7. Join into a round with a sl st.
Rnd 2: With 2nd color, ch 4 (counts as 1 dc and ch 1), *dc in next st, ch 1; repeat from * to end. Beginning with a row of foundation chain, the leaf is made in the round. The central colored section is made up of 2 rounds using the same color, the next two rounds use different colors. Two rounds of background color complete the leaf. Make a foundation of 70 chain, fairly loosely. Rows 1-5: Sc to end. Rows 1-2: Sc to end. Row 4: 6 sc, [2 sc into 2 ch sp, 12 sc.] 4 times. 2 sc into 2 ch sp, 6 sc. Row 5: Sc to end. Sew the buttons onto the button band to correspond with the buttonholes, and join the short ends together. Pin onto the cushion pad, just above the half way point. Using the diagram, pin the motifs together around the cushion pad. 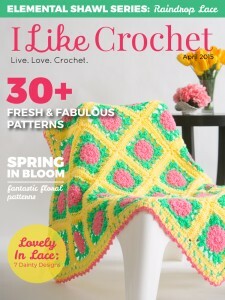 Where edges meet, join the motifs, right sides together, with single crochet going through the edges of each piece. This leaves triangular shaped gaps which can be filled using method outlined below. With wrong side of the work facing, at narrowest corner of triangular gap, join in yarn and work a sl st, taking in edge sts from each piece. Make an sc in one edge, and join to opposite edge. Make an hdc and join to opposite edge. Continue in this way, using sts of increasing height, until gap is closed to your satisfaction. If you do a treble and the gap still needs filling, work a series of scs across the treble to the other edge. Weave in all ends securely. Because of textural nature of the cushion there is no need to iron it.